These are conversations we have every day. Sometimes with a child. Sometimes with a partner. Sometimes with ourselves. Those conversations are about procrastination. Putting something off today, thinking you’ll do it tomorrow, or the next day. Or next week. As a therapist, watching people try to change things in their lives that may be very difficult to change, procrastination is often part of the process. If someone says, “Yeah, I didn’t get to that,” and the words are accompanied by a quick laugh, they’re probably admitting to not being motivated to get an unpleasant or difficult thing done. They may even be coming to me for help with this tendency. Usually, “fixing” it isn’t too hard. A dose of self-reinforcement or reward, or pairing a desired behavior with what’s not so pleasurable, can often do the trick. For example, years ago, I needed to study for the graduate record exam, the GRE. I’m not good at standardized tests, and absolutely dreaded taking it again. So I needed to study — something I hadn’t done the first time, resulting in a score that was less than stellar. I was also a huge “All My Children” and “General Hospital” fan. The tumultuous marriages and divorces of spicy Erica Kane had long been an addiction. Laura and Luke’s marriage warranted taking the whole day off. And I’d watched sympathetically as a long black-haired hippie Hayley got over her alcoholism, happily married her husband Mark (the actress was Kelly Ripa and it was her actual husband…), and became a blonde. So I conceived a plan for motivation. I made myself swear that I could watch one recorded episode for every hour I spent slaving over the books. It worked. I scored high enough to get in grad school, and the rest is history. But I wasn’t a chronic procrastinator. Many people are absolutely paralyzed by anxiety when triggered by things that for either a known or an unknown reason, seem un-do-able. Too hard. Too agonizing. Whatever decision needs to be made, or new behavior they desire, they cannot seem to move off square one. They don’t say, “I procrastinate” and laugh. They say, “I procrastinate,” and the look on their face is desperation. Often they feel humiliated by how insignificant their fears seem. “I don’t know why I can’t do this… everybody can do this.” So there’s severe shame. They can’t open their mail, for fear that there will be bad news. They don’t do the laundry or begin a paper for school, because they don’t know where to start. They don’t go to a gym, not because they’re overweight, but out of dread of not knowing how to work the machines. They can’t order food at a McDonald’s drive-through, because they’re too anxious, worried they’ll forget something. And shame increases exponentially every time they freeze. You might think that “procrastinators” lives aren’t productive or successful. And that might be true, dependent on how many areas of their lives the procrastination affects. However, the four examples above are all from people I worked with, who had great careers, wonderful families. What existed were pockets of anxiety, certain things that overwhelmed them. They might have a panic attack when trying to confront those things, and might then develop “panic about panic,” meaning they needed and wanted to avoid that trigger for fear of pain returning. Procrastination can happen for lots of reasons. And the four examples above are not actually all about simple avoidance. 1) Is it avoidance, as in Post Traumatic Stress Disorder? The first example above was someone who had had trouble with the IRS, due to not paying her taxes for several years. Her fear was completely connected with the emotional trauma that had caused, and got re-triggered when official-looking envelopes arrived. It wasn’t simply putting things off. It was avoidance of anything having to do with the IRS. She hadn’t fought in a war, but for her, those couple of years had been highly traumatizing. 2) Is it Attention Deficit Disorder? The field of ADD is immense, and I’m not an expert in it. But people with ADD or ADHD have a neurological difference that causes them to severely struggle with focus. The second example above was more about focus, than procrastination. If you don’t have a focusing issue, you can approach a pile of laundry easily. Sort into colors and whites. Or towels and sheets. Whatever organization you use. People with focusing problems can get lost in that process, and develop severe problems with self-worth. I’ve seen a vast difference in someone’s sense of self-competence and esteem after they began taking medication for ADD or ADHD. 3) Is it the consequence of helicopter or abusive parenting? If things were done for you as a child, or even as an adult child, you may not have learned how to organize your own thinking, or prioritize your own choices. In helicopter parenting, you can come to understand, “Even if I don’t do it, it still gets done.” You may not have been allowed to make a few mistakes, and then find a way to make it better. That entire process, while not all that pleasant sometimes, is the way we develop a sense of self-competence. And kids with helicopter parents have to fight to get that experience. If you were abused as a child, or heavily criticized, you can also develop the tendency to stay invisible. You fear making a mistake, or looking like you don’t know something. And it can paralyze you. 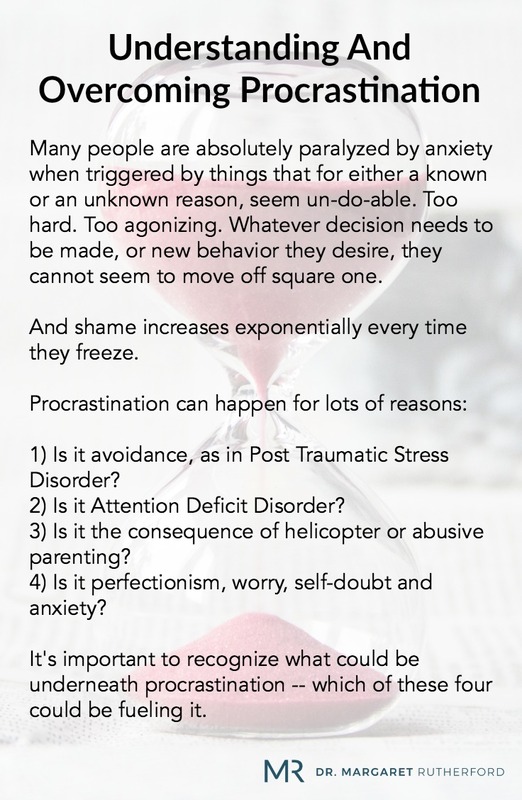 4) Is it perfectionism, worry, self-doubt and anxiety? Years ago, one of my patients called procrastination, “insecure perfectionism.” I’ve thought of that concept often, and agree that rings true in many cases. The diagnosis of Generalized Anxiety Disorder describes people who can feel crippled with worry and anxiety, a sense of dread, and may repetitively visualize horrible things happening. They overthink and overanalyze — and that can lead to putting things off, as they try to imagine every bad scenario that might occur if “x” happens. 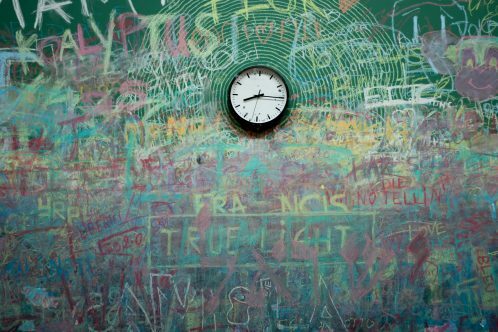 It’s important to recognize what could be underneath procrastination — which of these four could be fueling it. If it’s about past trauma, then trauma-related work needs to occur, whether that’s EMDR or some other kind of trauma work. If it’s a focusing issue, then techniques like biofeedback or neuro-feedback might be helpful, or perhaps medication is a possibility. If it’s a product of poor or abusive parenting, there may be an underlying depression that needs to be addressed. If it’s mainly anxiety, then calming techniques such as mindfulness or meditation could be useful, hypnosis is a possibility, cognitive work (challenging those irrational thoughts) and regular exercise could also be helpful. The first step with any of these causes is confronting your shame. Having compassion for yourself, and then beginning to unravel the how and why of your procrastination. You can feel and be… the person you believe you can be.